Drug Alcohol Treatment Center Orange County - Blog: E-Cigarettes: What is Your Perception? E-Cigarettes: What is Your Perception? E-cigarettes continue to be a source of division on a number of points. Mainly, people are in dispute as to whether or not the devices are healthier than traditional cigarettes. People also disagree about the use of e-cigs for smoking cessation. Unfortunately, there is little research to draw from, and the studies that do exist are at times at odds. It often the case that people's perceptions about all things health related is not rooted in science, without having all the facts one puts himself at risk. Let's face it; there was time when doctors supported the use of one brand of cigarette over another. While tobacco had been smoked for hundreds of years by European-Americans, it was not until 1964 that the Surgeon General of the U.S. Public Health Service, Luther L. Terry, M.D., released the first report on the Surgeon General's Advisory Committee on Smoking and Health. After reviewing over 7,000 studies that were published at the time, it was concluded that cigarettes, in fact, cause chronic bronchitis and cancer—the Centers for Disease Control and Prevention (CDC) reports. Since that time, there have been thousands of studies conducted, and we have learned that tobacco can lead to a number of forms of cancer and heart disease; nevertheless, people continue to smoke despite the apparent risks. So here we are now, 52 years since the first Surgeon General’s warning on cigarettes, debating points of health regarding e-cigarettes which deliver nicotine in a vapor form rather than smoke. It is fair to say that there isn’t even a minute fraction of research available dealing with e-cigs for the Surgeon General to deliberate on, compared to the report released in the 1960’s. In the meantime, Americans are using e-cigarettes with little idea what kind of health problems may develop down the road. It is worth noting, that e-cigarette sales rose exponentially for the last several years, becoming a multi-billion dollar industry. However, e-cigarette sales were down 6 percent in the first quarter of 2016, according to Wells Fargo Securities. Even still, sales in the United States are estimated to reach $4.1 billion in 2016. So why the sudden drop in sales? A survey conducted by Reuters/Ipsos found that people's views on electronic cigarettes are changing, compared to the same time last year. 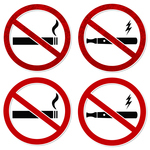 A significant number of the polls' respondents conveyed negative attitudes about e-cigarettes. 66 percent believed e-cigs could be addictive, compared with 61 percent. 49 percent said nicotine vapor could be as unhealthy as second-hand tobacco smoke, compared with 42 percent. 47 percent said vaping isn’t healthier than traditional cigarettes, compared with 38 percent. 43 percent did not believe “vaping” could help people quit smoking, compared with 39 percent. The poll of 9,766 adults found that about 10 percent of adults say they use e-cigarettes. It will be interesting to see if that number goes up or down in the coming years as people amend their perception. Nevertheless, nicotine is still addictive and can have negative effects on one’s health. It's also worth noting that other forms of smoking cessation therapies have been found to be more effective. "We think there are certainly more and better ways to help smokers to quit," Erika Sward of the American Lung Association told Reuters. "When you're going to e-cigarettes, you're not quitting, you're switching."